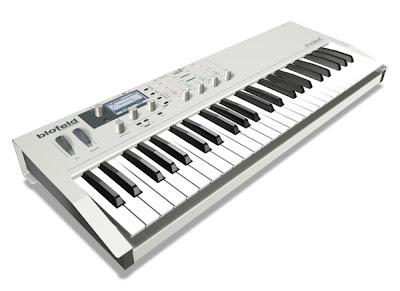 Always nice to see a new hardware keyboard, and the new Waldorf Blofeld Keyboard is nice-ish. Hard to really judge the look from renders (although it's already on sale at Dolphin) - but it's visually reminiscent of the discontinued Alesis Ion. Unfortunately, unlike Alesis, they haven't added any knobs - so this does little more than a £299 desktop Blofeld and a cheapo MIDI controller. And yet... the keyboard also includes 60mb of sample memory. It's far from clear what this means (the Waldorf blurb is: "Just imagine to add a vocal-like noise spectrum to a typical Wavetable pad, spice-up a virtual-analog solo sound with a strong attack sample or just process any other sample with the countless oscillator and filter modulations.") or whether a future Blofeld desktop upgrade can add the sampling option. i hope I have one of that.. very beautiful! i hope i have one too. i really like listening keyboards but i don't know how to play it. But can it do what my Pro-One does? (have a listen at audiocookbook.org) I think I would miss the knobs, although it looks as though it has a few.